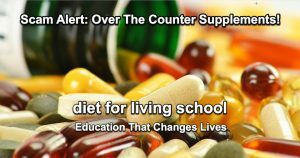 Scam Alert: Over The Counter Supplements! I gotta admit….I’m on a crusade to invite everyone to examine the over the counter supplements they are consuming. Too often, when we get a diagnosis of any kind, our first response is to fly out the door and load up on vitamins and minerals. We want to ‘hurry and get well’. In our haste we give up our power and common sense to bottles of white pills and powders made by the same companies that make processed foods. We are fueling the growth of a $28 billion nutritional supplement market. It is estimated that at least 90% of all vitamin supplements contain ingredients that are nothing more than manufactured fillers. Just as processed foods are loaded with additives, so are vitamins. Some of the most common additives are magnesium stearate, silicon dioxide, titanium dioxide, microcystalline cellulose, stearic acid, talc, simethicone and propylene glycol. You will find some of these listed as ‘other ingredients’ at the bottom of the ‘nutritional panel’ on the back of the supplement bottle in teeny weenie little letters. Sometimes they are only listed as ‘inactive ingredients’. Over the counter supplements lead us to believe if we bombard the body with little white pills and powders we will win the battle we are struggling with. Aside from the supplements being toxic, the chemical fillers themselves are acidic and cause chronic inflammation. One: If it is ‘white and bright’, be very suspicious. There is very little in Nature that is pure white. Two: If it is bottled or boxed it has to have been exposed to high heat to preserve shelf life. High heat destroys 50% of the protein, 80% of the vitamins and minerals, 100% of the enzymes and 100% of the probiotics. With no exceptions. This includes protein powders, green dietary supplement powders and body building powders. Three: Vitamin and mineral supplements made in China are a bigger problem than you may realize. 90% of vitamin C is made in China. Only 2% of all imported supplements are inspected. This is not to say the U.S. Is your ‘nutritional best friend’. Authorities have conducted tests on top selling brands of herbal supplements and found four out of five did not contain any of the herbs on their label. This is an insult to the integrity of our precious bodies. If your health is at risk and you are struggling to get well, you want to absolutely know for sure that what you put in your mouth is the real deal. Something you can completely trust. Healing the body is a dedication to understanding how it works and what it truly needs. 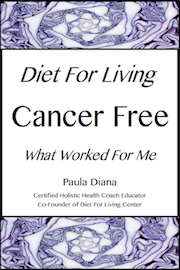 When I was healing my body naturally from cancer it required a complete learning curve from what I had been led to believe was healthy living. The knowledge I acquired is what we teach here at Diet For Living School so that you can then go out and teach it to others. As a Living Foods advocate and educator, I believe the best vitamins and minerals come only from organic live plant based foods and Superfoods. When the immune system is compromised and the body strained from fighting off disease, SuperFoods are our greatest allies. Superfoods are a class of potent, super-concentrated, nutrient dense foods which offer tremendous dietary healing potential while replenishing vitamin and mineral reserves in the body. Incredibly nutritious, these powerful live-plant foods offer clean sources of protein, vitamins, minerals, enzymes, and the good fats and oils. Essential fatty acids, amino acids and other bio-available nutrients help healing take place. They are the Divine’s gift to us so that we can maintain ultimate health. In our Botanical Alchemy class we teach you how to make Superfoods into Whole Food Supplements and Elixirs. Learn this new way of getting the essential nutrients the body needs in their pure form. A new day is dawning on the world of nutrition. As wellness coaches and educators that want to bring the best information to our clients, you’re going to want to get on board! Our October Health Coach Class has filled. If you have dreamed of becoming an educator that makes a difference in the world of healing, sign up for our Newsletter so that you can keep up with upcoming classes, sales and bonuses.